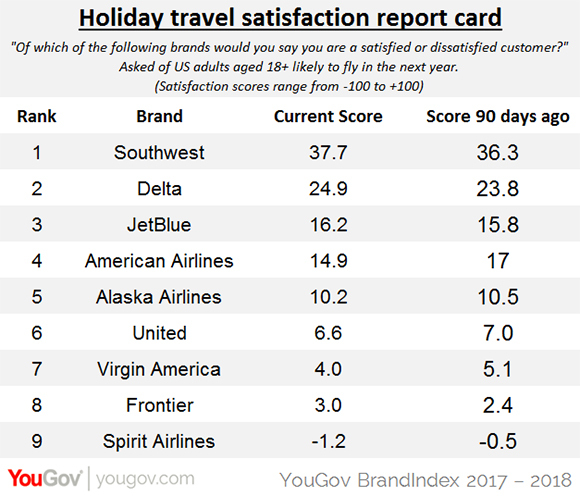 JetBlue moved up from fourth to third place over the past 90 days in YouGov BrandIndex's annual holiday travel satisfaction report card. JetBlue switched places with American Airlines, which dropped down one spot to fourth place over the same period. Both Southwest and Delta maintained their first and second place positions respectively. This is particularly good news for Delta, which was in fifth place in last year’s report card. Unlike last year, there were no airlines that changed their scores by a statistically significant amount. However, Southwest, Delta, JetBlue, and Frontier were the only airlines to nudge their scores in a positive direction over the past three months. For the past 90 days, YouGov BrandIndex surveyed consumers 18 and over who are considered “expected fliers” – they are either somewhat likely, likely, or very likely to take an airline trip in the next 12 months. To determine satisfaction, respondents are asked: “Are you a satisfied customer?” The scores were measured over 90 days, with an end date of January 3, 2018.